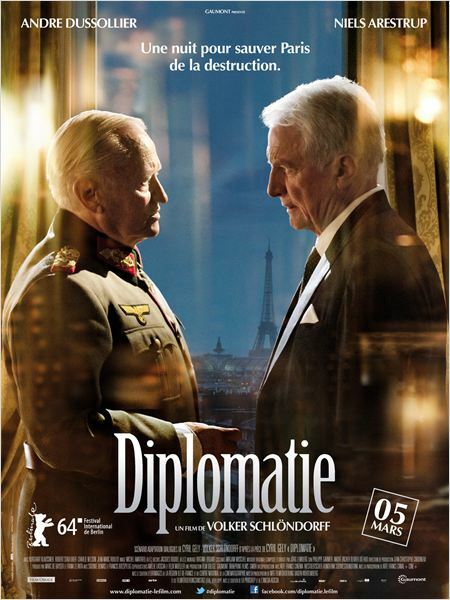 André Dussollier and Niels Arustrup engage in a captivating battle of words in German director Volker Schlondorff’s adaptation of the 2011 hit play Diplomatie by French playwright Cyril Gely. Similar in theme to George Clooney’s The Monuments Men – notably the importance of preserving a country’s cultural heritage – Diplomatie verbally twists and turns as it becomes clear the question of saving Paris for both men is a personal rather than a moral issue. It’s the morning of 5th August 1944 and the Allied forces are at the gates of occupied Paris. General Dietrich von Cholitz (Arustrup) sits in his room at the Hotel Meurice waiting to give the order for his troops to set off a series of explosions strategically placed around the capital. Enter the Swedish consul Raoul Nordling (Dussollier) whose mission is to persuade von Cholitz not to go ahead with the destruction of the city. The general is not an easy man to convince. At first dismissive and patronising, von Cholitz gradually weakens under the skill and audacity of Nordling’s reasoning. In truth, the General has his doubts about Hitler’s leadership and proves receptive to Nordling’s argument over the legacy he leaves behind. The general’s ultimate decision is never in doubt, but the beauty of Schlondorff’s film lies in the tension he creates between the two main characters. Nordling, a slightly oily, wheedling character has nothing to trade with von Cholitz. His trump card is an appeal to the general’s vanity and his own genuine love of the city. Is this enough, or does Nordlinger have to probe deeper to find the general’s true Achilles Heel?